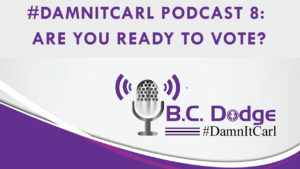 You are here: Home / Uncategorized / #DamnItCarl Podcast 8: Are You Ready to Vote? #DamnItCarl Podcast 8: Are You Ready to Vote? On this #DamnItCarl podcast B.C. Dodge asks – Are you ready to vote? This November 6th with be a pivotal moment in United States history – but we would have to assume that has been said before. But, the only way to be part of this moment is if you vote. B.C. freely admits that he has never voted in a midterm election before, but this time around he is doing what he can to make sure that he does. Besides the widening social economic gap and racial divide, there are polices that are being put into place such as family or child separation for people trying to enter the country illegally; or the big story of the United States withdrawing from the nuclear treaty that has been in place for the past 30 years – you know… so we don’t annihilate the world; and these polices need to be addressed and or stopped. But if people don’t vote nothing will change, and while sometimes it feels like votes don’t matter…you still need to go and vote, because they due matter. And there might be local issues on your ballot that you are unaware of. That closed factory next to your house will become a chicken poop processing plant…unless you vote! Make sure you subscribe to, what will become one of the best podcasts right now. And also check out all the podcasts on the Venn Network and make sure to like, subscribe, and share this the content. And introducing the new Venn Network t-shirt, which you can own by heading over to Amazon.com. When you buy one of these shirts you help, not only support the network, but you also help support the hosts. The Venn Network is growing, and it is only with support from listeners – like you – that we can reach those in need of hearing our message! Do you have questions or thoughts on the show? Subscribe to Raw Islam Today!